Arthur C. Clarke was a famous Writer from England, who lived between December 16, 1917 and March 19, 2008. He became 90 years old. 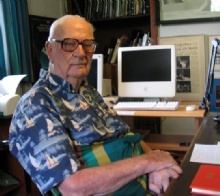 Arthur Charles Clarke was an English science fiction writer. He was known as the one who launched the idea of ​​using satellites in orbit to transmit radio signals. He is born under the zodiac sagittarius, who is known for Philosophical, Motion, Experimentation, Optimism. Our collection contains 28 quotes who is written / told by Arthur, under the main topics: Motivational, Business, Patriotism, Politics, Religion. "When a distinguished but elderly scientist states that something is possible, he is almost certainly right. When he states that something is impossible, he is very probably wrong"
"This is the first age that's ever paid much attention to the future, which is a little ironic since we may not have one"
"The limits of the possible can only be defined by going beyond them into the impossible"
"The intelligent minority of this world will mark 1 January 2001 as the real beginning of the 21st century and the Third Millennium"
"The greatest tragedy in mankind's entire history may be the hijacking of morality by religion"
"Sometimes I think we're alone in the universe, and sometimes I think we're not. In either case the idea is quite staggering"
"Reading computer manuals without the hardware is as frustrating as reading manuals without the software"
"Politicians should read science fiction, not westerns and detective stories"
"Perhaps, as some wit remarked, the best proof that there is Intelligent Life in Outer Space is the fact it hasn't come here. Well, it can't hide forever - one day we will overhear it"
"Our lifetime may be the last that will be lived out in a technological society"
"It may be that our role on this planet is not to worship God - but to create him"
"It is not easy to see how the more extreme forms of nationalism can long survive when men have seen the Earth in its true perspective as a single small globe against the stars"
"It has yet to be proven that intelligence has any survival value"
"If an elderly but distinguished scientist says that something is possible, he is almost certainly right; but if he says that it is impossible, he is very probably wrong"
"I have a fantasy where Ted Turner is elected President but refuses because he doesn't want to give up power"
"I don't pretend we have all the answers. But the questions are certainly worth thinking about"
"I don't believe in God but I'm very interested in her"
"I don't believe in astrology; I'm a Sagittarius and we're skeptical"
"Human judges can show mercy. But against the laws of nature, there is no appeal"
"Every revolutionary idea seems to evoke three stages of reaction. They may be summed up by the phrases: 1- It's completely impossible. 2- It's possible, but it's not worth doing. 3- I said it was a good idea all along"